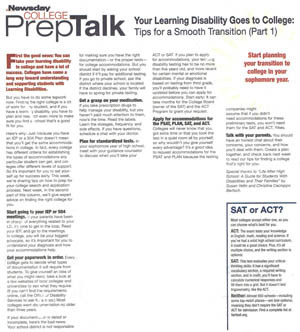 A special section in yesterday's edition of Long Island, NY newspaper Newsday included an informative article about planning the transition to college for students with learning difficulties, with content informed by Susan Yellin's book (co-authored with Christina Bertsch) Life After High School: A Guide for Students with Disabilities and Their Families. Part two of this useful series is planned for next week. Susan Yellin, Esq. provides advocacy and college transition planning services at The Yellin Center.